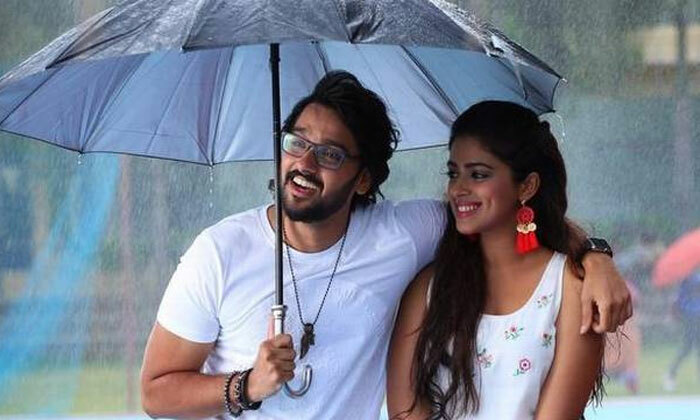 After facing a series of debacles, Sumanth Ashwin whose previous outing ‘Happy Wedding’ also faced the same fate has now pinned all his hopes on his upcoming movie ‘Prema Katha Chitram 2’. The title itself is hinting that the movie is the sequel of super hit film ‘Prema Katha Chitram’. Nandita Swetha and Siddhi Idnani of ‘Jamba Lakadi Pamba’ Fame played the female leads in this movie. Vidyullekha, Krishna Teju played vital roles in this film directed by Hari Kishan. Bankrolled by R Sudarshan Reddy, Prema Katha Chitram 2 hit theatres today on April 6th, 2019. Let’s check out the review of the film. Prema Katha Chitram 2 has got a routine story where a young girl Bindu (Siddhi Idhnani) commits suicide as she tastes a failure in love. She then haunts Nandu (Nanditha Swetha) and troubles Sudheer (Sumanth Ashwin)’s life. Why did Bindu commit suicide? Who is Sudheer? Why did Bindu haunt Nandu? Forms the story of the movie. Nandita Swetha is an absolute stunner. Not only in the romantic scenes but also in horror scenes, her performance can be considered as one of the major plus points for the film. Sumanth Ashwin is one such actor who showcases improvement with each of his films and he has shown a great improvement in this movie too when compared to his previous flicks. Siddhi Idnani went into the skin of the character and justified her role. Her chemistry with Sumanth Ashwin also worked out really well. Vidyullekha did a decent job. Her character is strong and funny. Krishna Teju who played the sidekick of Sumanth Ashwin got a meaty role and he did a good job. NTV Sai justified his role. The rest of the cast also made their presence felt. Director Harkishan has prepared a simple and not-so-complicated story for the film and laced it with lots of vulgar comedy and only a few horror elements. More than the horror scenes, the comedy scenes are high. It would have been good if the director also focused more on the horror elements as well. Production values by R Sudarshan Reddy are pretty much decent. It is evident that the producers have not compromised in terms of quality of the film. Music by Jeevan Babu is really good. A couple of songs have already impressed the audience and his BGM in the movie suited well and elevated the scenes. Cinematography by C Ram Prasad is good to watch. Editor SB Uddhav did a good job. As ‘Prema Katha Chitram’ is a superhit, everyone expects that the sequel of the movie ‘Prema Katha Chitram 2’ also does the same magic at the box office as well as on the audience. But in reality, ‘Prema Katha Chitram 2’ movie is not even eligible to be called as the sequel. Though there are some references from the prequel, the movie doesn’t have a proper story and lacks in terms of logic. The slow-paced narration will test the patience of the audience. Coming to the comedy, some of the episodes are not funny but instead very vulgar. There is nothing scary in the film as well. On the whole, ‘Prema Katha Chitram 2’ is a boring film and can be avoidable.